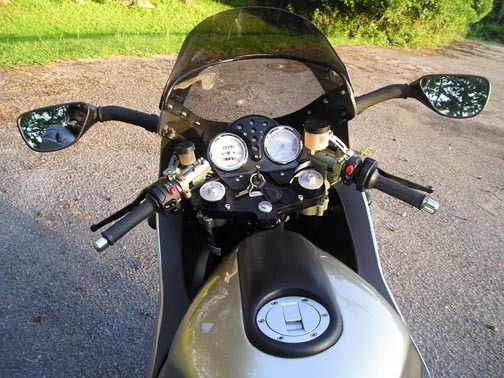 I noticed the other day while looking at Buells, the mirrors looked like the OEM Guzzi mirrors, but were about an inch wider or so and looked like they would get my elbows out of the picture. 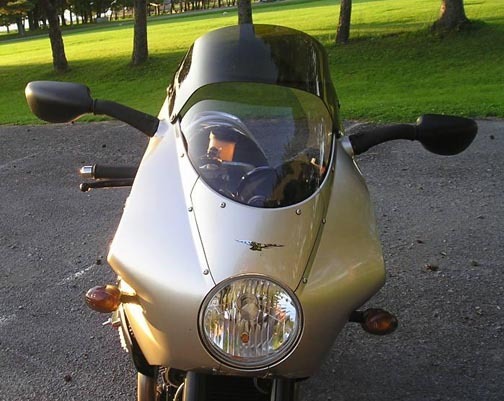 So, I purchased a pair of Buell Firebolt mirrors for my Le Mans. Instead of the Guzzi OEM replacement at $72.94 US for one mirror, Buells were less then $20 apiece. I had to swap mounting plates due to metric vs. STD and bolt length (Buell supplied were too long), but the swap was easy and the mirrors mount right up. Side-by-side photo shows they are a little longer then the Guzzi mirrors. These are made by the same company that makes the OEM Le Mans mirrors. They are sturdy, have a little curve to the stalk, and have the DOT warning on the mirror. Yes, they come complete for mounting on a Buell, so the "mounting plate", which I referred to above, is the actual piece that bolts through the fairing (on both bikes) in which the 2 studs on the Guzzi bracket are short and use 10mm acorn nuts. On the Buell, the 2 bolts are long and use 7/8" nuts (not supplied) and studs are too long anyway. 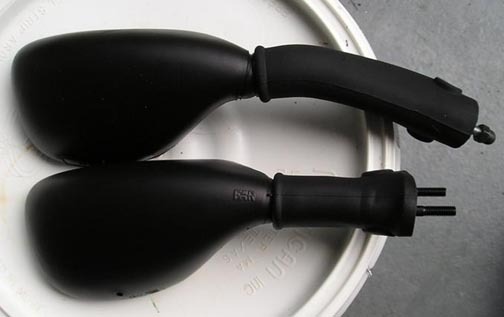 Under the rubber boot, is a bolt that you undo so you can put your Guzzi plate on the Buell’s stalk. Easy swap, pay close attention to orientation when you remove the plate and install it on the new mirror the same way. 20-minute job from start to finish. Upside is nothing is permanently modified, should you ever want to go back to stock.